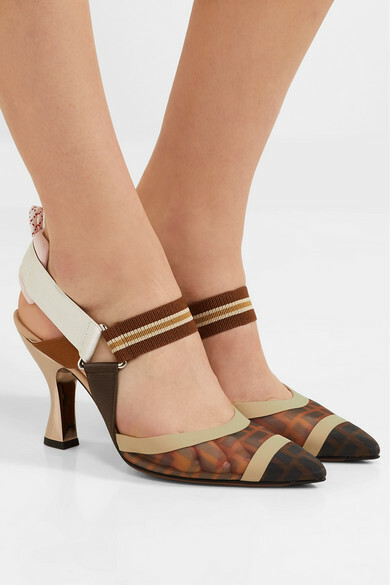 Silvia Fendi first debuted these 'Colibrì' pumps on the Spring '19 runway, where they were styled with patterned ankle socks to make them extra eye-catching. Inspired by mid-century Italian art, this updated pair has a monogrammed mesh upper and rubber trims and is set on a mirrored fluted heel. The elasticated slingback strap is backed with a cushioned pastel-pink panel for comfort. Shown here with: Fendi Shorts, Fendi T-shirt, CALVIN KLEIN 205W39NYC Shoulder bag, Jennifer Fisher Earrings.